Happy Spring!! 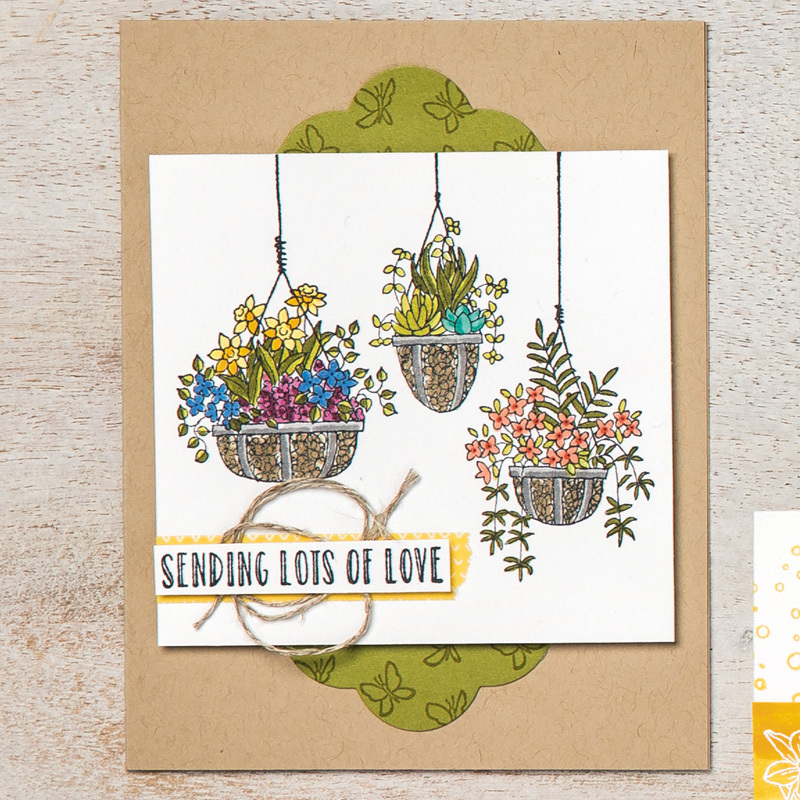 Today’s card was designed using the Stampin’ Up! 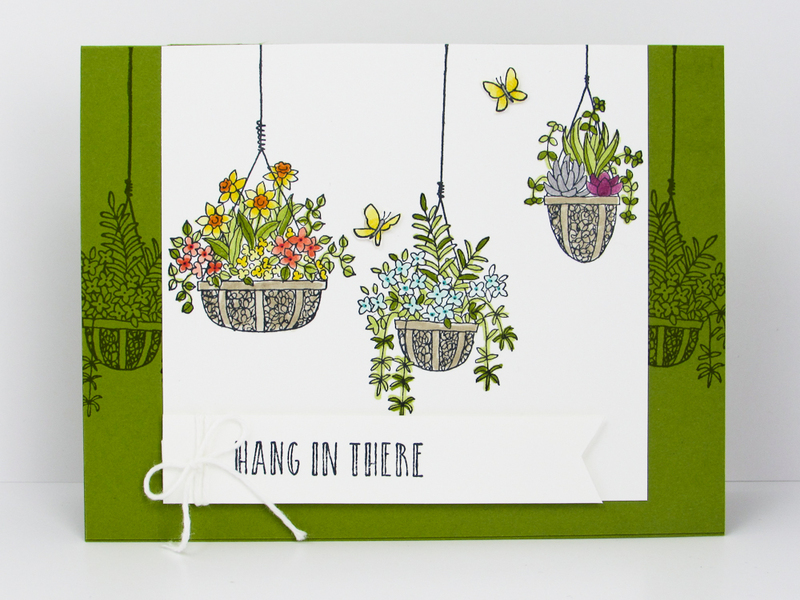 Hanging Garden Stamp Set. The images in the stamp set are just beautiful and so much fun to color. You can color them using our Stampin’ Write Markers or maybe you prefer Stampin’ Blends. 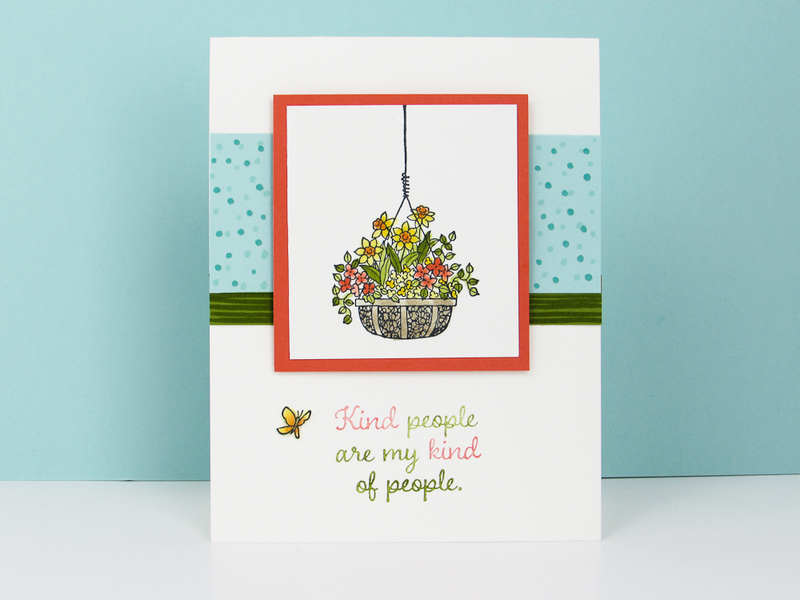 I love how these hanging baskets stamped in the background create the perfect scene for your colored basket on the front. Not to mention, I love the sentiments in this set! 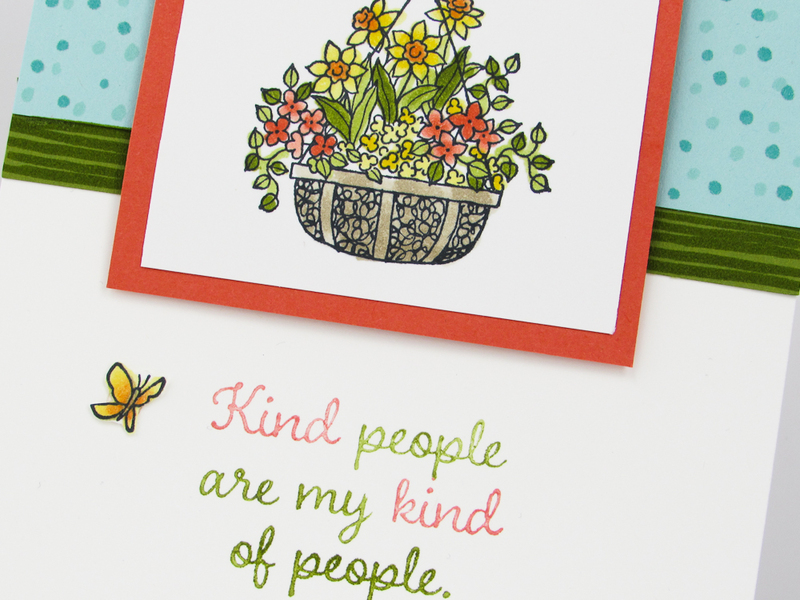 “Kind people are my kind of people!” Perfectly stated! 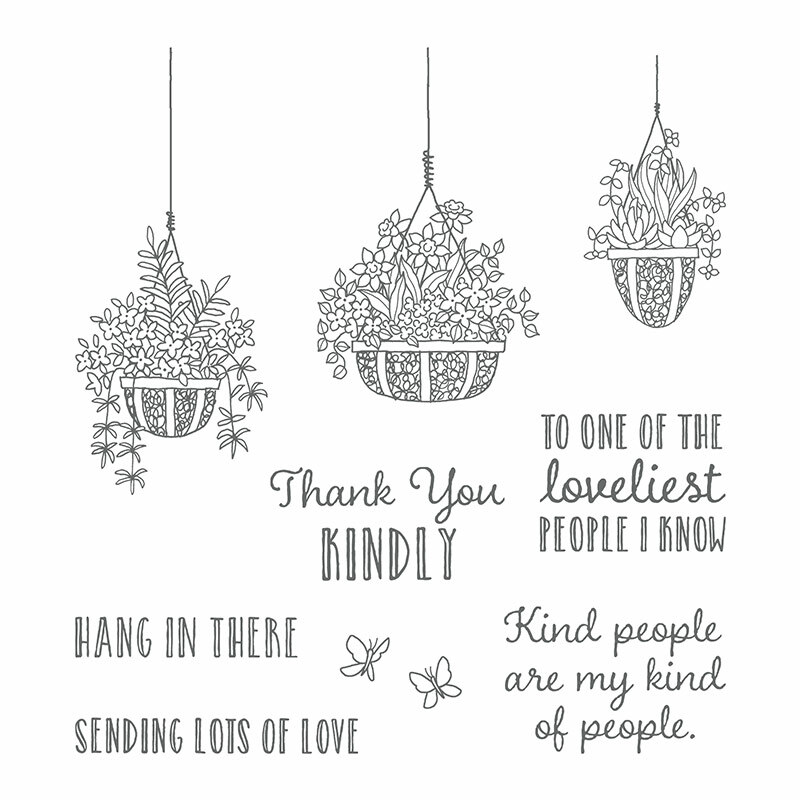 Thank you for stopping by Brandy’s Cards. I hope you enjoy today’s video tutorial. 2. Cut a 1-3/4″ x 4-1/4″ piece of Pool Party Cardstock. 3. Using a Dark Pool Party Stampin’ Blend and a Light Bermuda Bay Stampin Blend to add random dots to the Pool Party Cardstock. 4. 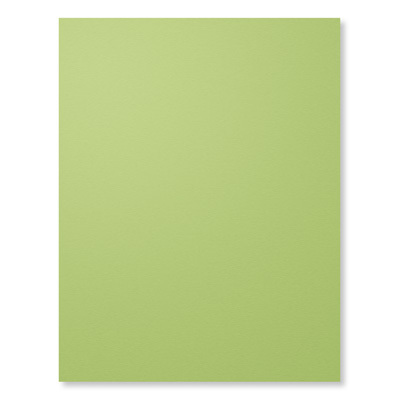 Cut a 1/2″ x 4-1/4″ piece of Pear Pizzazz Cardstock. 5. Using an Dark Old Olive Blend to freehand draw lines on the Pear Pizzazz Cardstock. This creates a fun striped cardstock. 6. Using liquid adhesive to adhere the Pear Pizzazz cardstock behind the dotted Pool Party Cardstock. Keeping in mind you’ll want about a 1/4″ of Pear Pizzazz stripes showing. 7. Using liquid adhesive to the Pool Party & Pear Pizzazz Cardstock to the card base. I added mine approx. 1-1/8″ from the top of the card base. 8. Cut a 2-3/4″ x 3″ piece of Calypso Coral Cardstock. This piece is to mat under your image. 9. Cut a 2-1/2″ x 2-3/4″ piece of Whisper White Cardstock. This piece is for your image. 1. 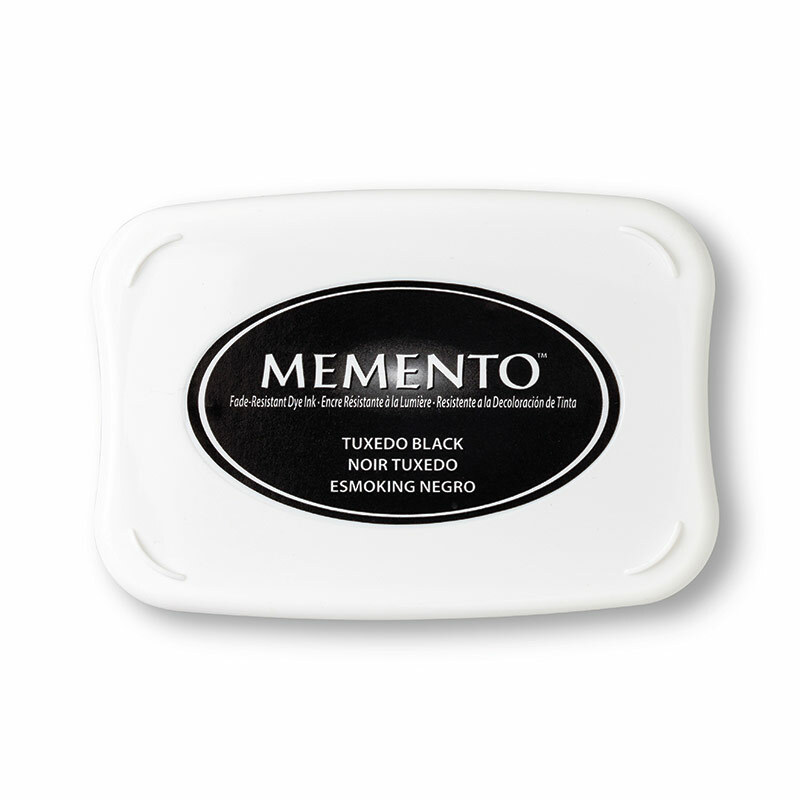 Using a Memento Stamp Pad to stamp the image on the 2-1/2″ x 2-3/4″ piece of Whisper White Cardstock. 2. 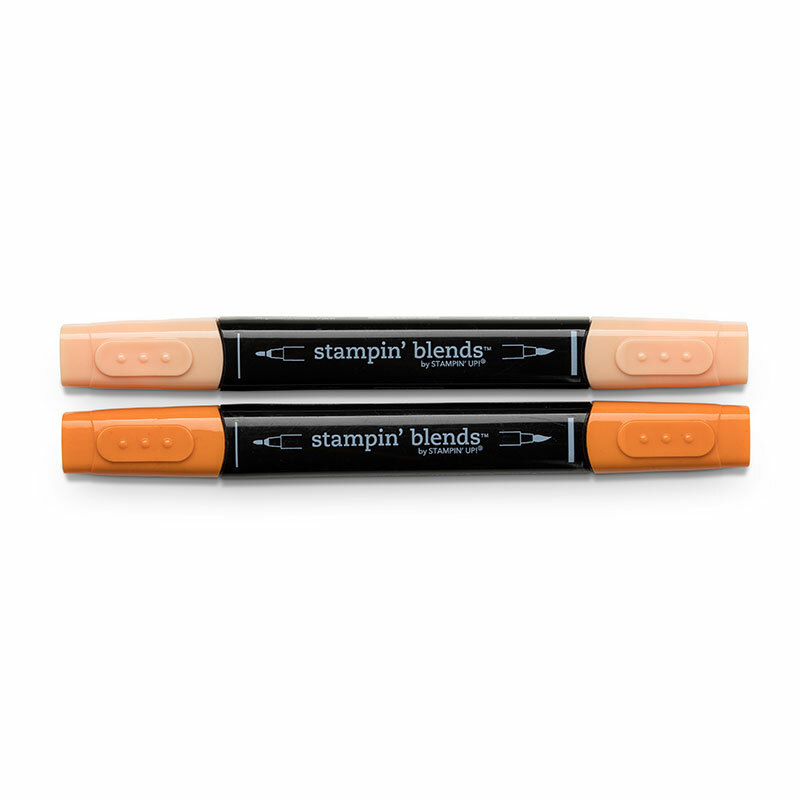 Color the flowers using the following Stampin’ Blends: Calypso Coral, Daffodil Delight, Old Olive and Crumb Cake. 3. Center and adhere this piece to the 2-3/4″ x 3″ piece of Calypso Coral Cardstock. 4. Add a few stampin dimensionals behind the Calypso Coral Cardstock and add it to the front of your card. 1. Using a Memento Stamp Pad to the butterfly on scrap paper. 3. Hand cut out the butterfly and adhere it to your card base using a mini glue dot. 4. 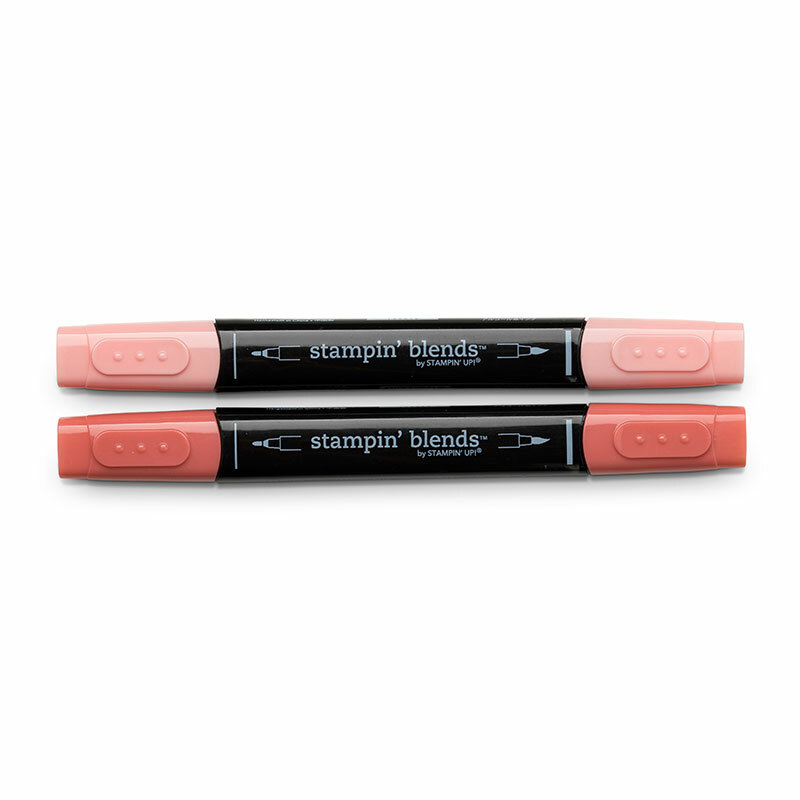 Color the sentiment using a Calypso Coral and Old Olive Stampin’ Write Marker. 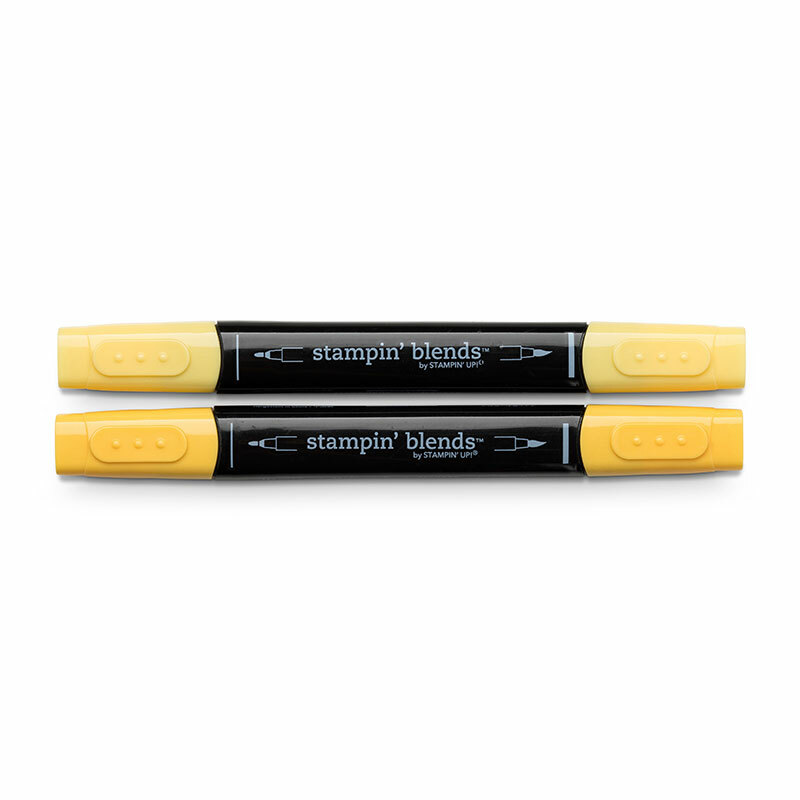 Stamp your sentiment on your card base. The website says it cannot find the Hanging Garden Stamp Set. Is it retired or coming out in the new cataog. It is a lovely card! Sorry had to tell you I loved your video of your boys. I have a son and a daughter and that video brought back so many memories of the adventerous stunts that my son and his friends did. So appreciate that we do sometimes have to “put on the brakes” Then you have the girls with their crafts and their fun Adventures. Enjoy these times because you turn around and they are grown up! Brandy thank you so much for this video. 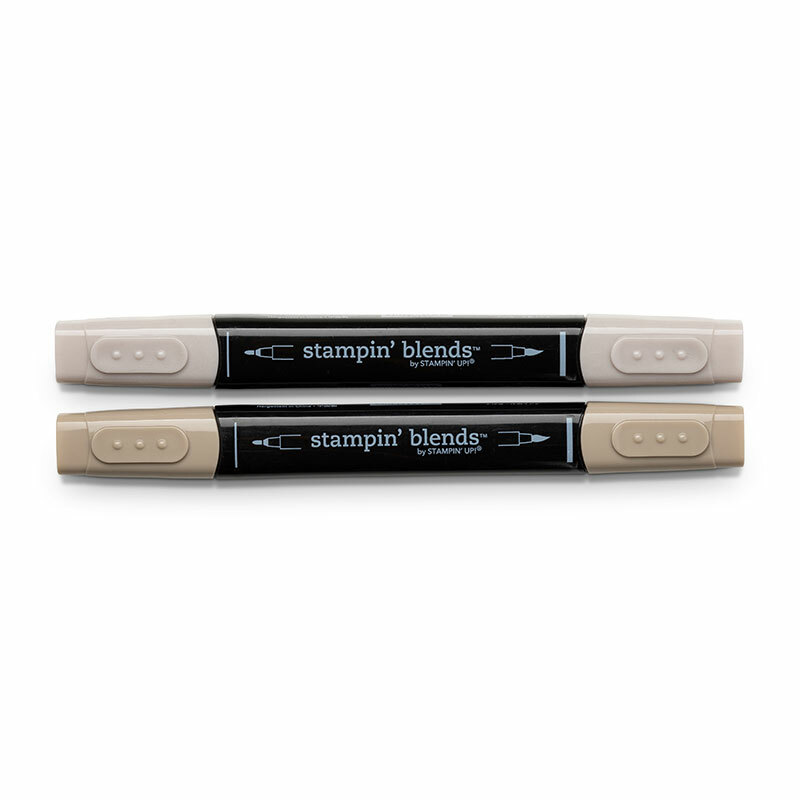 I recently asked you what was best to use to color this stamp set and here you are. I can’t wait to have the time to use this stamp set I purchased from you and now your coloring ideas as well. Happy Easter to you and your family! So pretty! 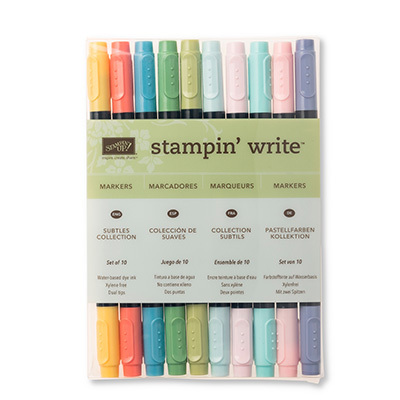 I have this stamp set on order & looking fiesta to playing with it! Brandy, Thank you for all of the videos and great inspiration! Glad you are feeling better! 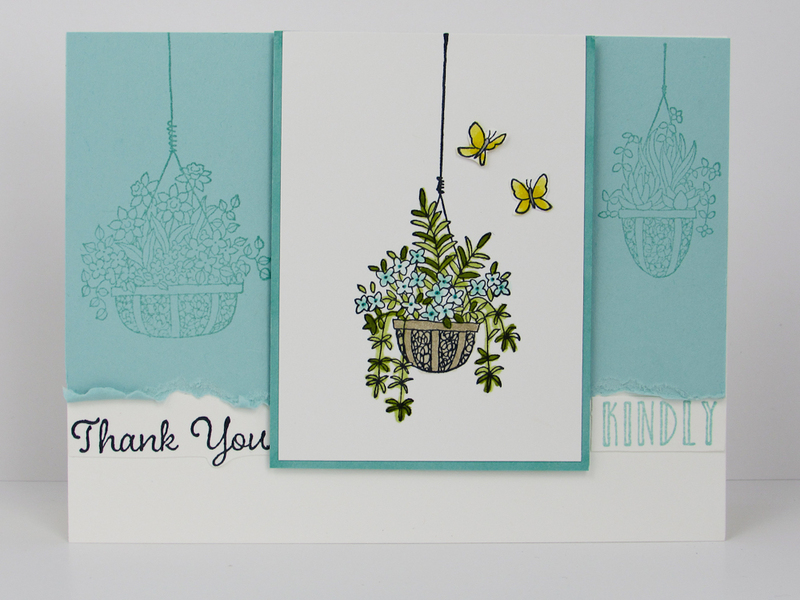 i do have the hanging garden stamps so I appreciate all the ideas you have shared with us. Dear Brandi, I so very much enjoy your videos. I do have a consultant here in Yuma AZ whom I love, but I am very grateful you keep sending me your videos. I love this card you demonstrated. The only thing I would add is to do a very pale gray color around the outside of the whole basket stamp that will make the image pop even more. I do this a lot and it really makes the image special. Keep up the good work and love hearing about your success with Stampin’ Up.